This Saturday was one of those that leaves me with a deep appreciation for living in Little Rock. It was one of those SURPRISE Saturdays (making it that much better) where Karl was out of town and I thought Nate and I might be searching hard to fill our hours because we were sans "Plan" for the day. Nate and I spent the day downtown starting at the Arkansas Literary Festival listening to local author Kyran Pittman talk about her book, Planting Dandelions (releasing late April). The session was about an hour and Nate made it through about 45 minutes before I hauled him outside to run around. We walked down to the River Market and had lunch with some friends (pizza! candy! bad mommy!) before heading to.... well our intent was to head to NAPTIME but we got distracted by the Game & Fish Center (it's free and Nate LOVES that place if you haven't been yet). While we were checking out the "FISH MOMMY!" for the 4,000th time and I was trying to convince Nate it was time to take it to the house, I received a text from a friend with the offer of Hairspray! tickets - the current show at The Rep (our THEEE-aaater), which also happens to be downtown. The show was starting approximately 30 minutes from when I got the text. We were almost a half mile from our car at that point but managed to make it to the car, drive the 10 or 12 blocks to the Rep, park (for the free and one block away) and STILL had time to wander around the lobby at the theater before the show started. LOVE that. If we ever move to a bigger city, I shall be sad about the 10 minute commute to, um, EVERYWHERE and the ample downtown parking. Hairspray was A JOY. For real. The cast was fabulous AND the best part? Nate SLEPT through half of it. 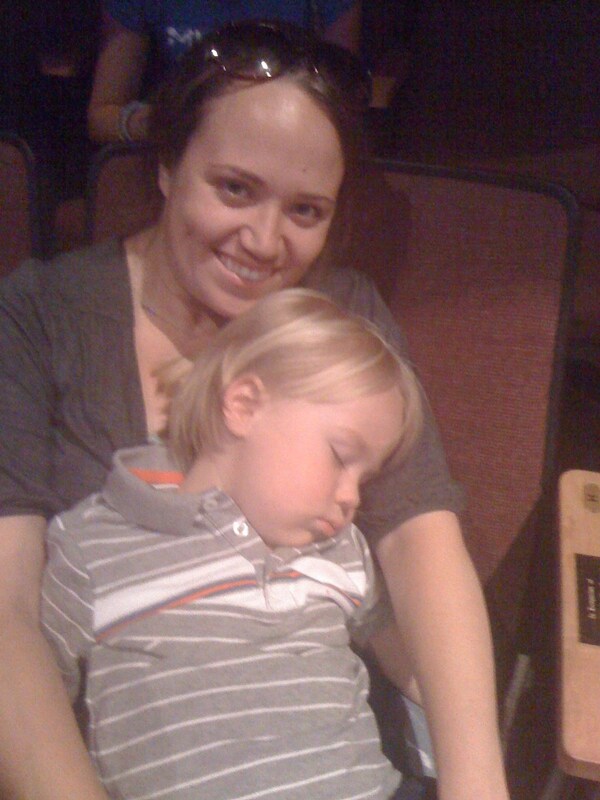 I don't know how since it was LOUD (we were close) and I can't pay that kid to sleep most days but he fell asleep half way through the first act and made it well into the second before waking up. I was a little worried about taking him w/o a nap and somewhere unfamiliar BUT I've never been so glad I took a chance. When he wasn't sleeping he was ENCHANTED with the singing and the dancing. I'm not sure what was a bigger treat - the amazing show or the three hour of relatively still toddler in lap! What a great show! The actress who played Penny Pingleton? I would like her to be my new BFF please and thank you. POINT OF THIS POST? None! We've been LAZING it up today (Sunday) in recovery. @Melissa - yes! I'm hoping your feeling much better! It was so super fun to see you TWO TIMES in one day. I love your face. And Nater's, too. That Penny Pingleton? She's the one I fell in love with during her one song as Mistress in Evita. Fun weekend! Still puking? I say girl. Read this the other day but couldn't comment from phone - wanted to say that I was SO SUPER GLAD y'all could make it!